Putnam County Playhouse: Final Show of the 2017 Season! Laughing Stock! Final Show of the 2017 Season! Laughing Stock! 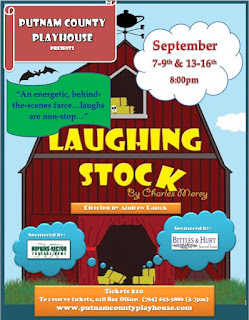 Murphy’s Law could be a replacement title for this fun romp that tells the tale of a summer theatre troupe that performs their repertory season in an old converted barn (Sound Familiar???) with hilarious outcomes. All of the characters necessary to lampoon the art of theatre are here: invisible producers that really run the show, wacky directors that think rehearsals just get in the way of true performances, a tottering older couple who know nothing more than their lives in the theatre, the spaced out actress, a “serious” actor who must find motivation for every possible movement on stage, an artistic director who writes his own scripts to save on royalties, and even a drunken stage manager holding it all together by a very loose thread. Mix these misfits in with a season that includes the plays Hamlet, Dracula, and Charley’s Aunt and you have a delicious and hilarious recipe for disaster. The Cast of Laughing Stock is headed by PCPH veteran, Dustin Bond who plays Gordon Page; he is joined on stage by Dustin Boothby (Jack Morris). Ashlee Vitz returns to the Playhouse stage as Susannah Huntsman; while newcomer to PCPH MacKendra Stewart plays Mary Taylor. T.J. Tincher, who delighted audiences in this season’s hit, The Foreigner, returns in Laughing Stock as Tyler Terry. PCPH veterans Jim Rambo & Don Wilson, last seen in 2016’s musical, 1776, are seen in our season finale as Vernon Volker and Richfield Hawksley, respectively. Dianna Baysinger plays Daisy Coates and Andrew Ranck lends his comedic talents to his character, Craig Conlin. Caroline Good, last seen as Grandma in The Addams Family, plays stage manager Sarah McKay. Kathryn Dory makes her return to the PCPH stage as Helen Mills with newcomer Brian Cox (Braun Oakes). Sandra Rossok (Karma Schneider) and Drew Harris (Ian Milliken) play overworked interns in the hilarious happenings of the season. Director Andrew Ranck is assisted by his production staff: Stage Manager, Jessica Masner; Technical Director, Dusin Bond; Stage Design, Linda Gjesvold; Costume Design, Shelly McFadden; and Production Assistant, Aubrey Sutherlin. Come join us for the 4th and final show of the season at the Playhouse. You’ll laugh and you may also gain a little insight into why we do what do! The Addams Family is Coming!